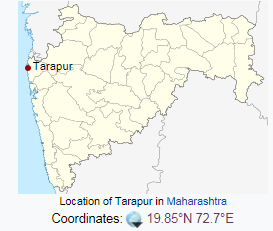 Tarapur is a census town in Palghar district (earlier Palghar was taluka and has recently notified as district) in the Indian state of Maharashtra. It is an industrial town located some 45 km north of Virar, on the Western Railway line of Mumbai Suburban Division (Mumbai Suburban Railway). 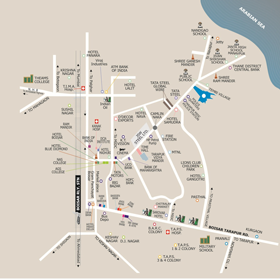 Tarapur can be reached from Boisar, the nearest railway station. It is 20 km off National Highway NH8. 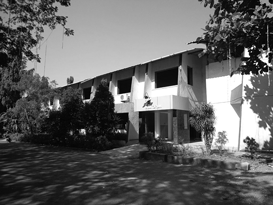 In 1975 when the State Government had approved setting up of industries in various Districts of Maharashtra State, the State industrial and Investment Corporation of Maharashtra Ltd., (SICOM) selected Boisar - Tarapur, an Adivasi area to develop as a growth centre and channeled its efforts to make it one ofthe modest Industrial complexes in Maharashtra. During the years since 1975 and until 2016 Tarapur has been zooming with Industrial activities and purposeful growth in that direction. MIDC has allotted nearly 1500 plots out of which nearly 1500 factories have become operational by 2006 manufacturing a variety of products say from Steel to food. The industries are categorized as Small, Medium and Large based on their investment as per guidelines issued by the District Industries Centre & Central Government. By end of 1980 a handful of Industries only became operational and others were in the pipe line. Entrepreneurs assessing the growth of Industries in the future formed an Association to take care of common interests of Industries related to MIDC, MSEB, TELECOMMUNICATION, MPCB, RAILWAYS and other Central and State Government Agencies including the banking facilities etc. TIMA has been constantly engaged in representing the industries problems, suggestions, viewpoints etc., for redressal with the various agencies like the State and Central and Autonomous bodies. Periodica Meeting were held with MSEB, MIDC, Telecom Department, MPCB, Railways, including Industry & Energy department of Government of Maharashtra for improving the infrastructure facilities required by our industries. TIMA has also been taking keen interest in various welfare activities inviting prominent Specialists / Doctors from local areas and also from the Cities to educate workers employees and supervisors at various levels particularly those working in the hazardous factories. Seminars, Workshops and lectures have been conducted / delivered on various health aspects including handling of situation in emergencies.